Season series (1-1): Kansas def. 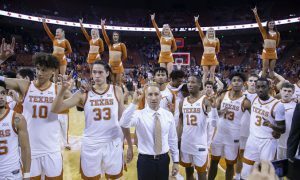 Texas, 80-78, in Lawrence, Kan., on Jan. 14; Texas def. Kansas, 73-63, in Austin, Texas, on Jan. 29. Texas: G Matt Coleman III, G Jase Febres, G Courtney Ramey, F Dylan Osetkowski, F Jaxson Hayes. Kansas: G Quentin Grimes, G Devon Dotson, G Ochai Agbahi, F David McCormack, F Dedric Lawson. 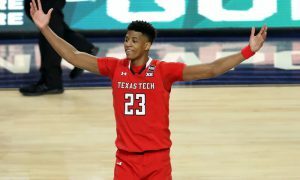 Texas: Kerwin Roach II. Texas reinstated Roach’s eligibility entering the Big 12 Tournament, so the Longhorns get their leading scorer back for the matchup with Kansas. Despite missing the season’s final six games, Roach averaged 15 points per game, nearly five points more than Hayes, Coleman and Osetkowski. Roach’s return is well-timed as the Longhorns went 1-5 during the stretch without him. 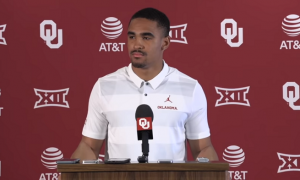 I’m not projecting him as the starter for Thursday’s game because head coach Shaka Smart may want to start him off the bench. 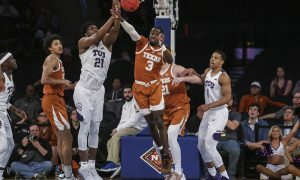 But should he start, Febres is likely the player that heads to the bench, which isn’t bad for the Longhorns, as Febres has become the team’s best 3-point shooter. Kansas: Lawson. At this point everything flows through the talented junior, who could declare for the NBA Draft after the season. In Big 12 play he averaged a double-double — 18.7 points and 10.2 rebounds per game — and had 20 double-doubles for the entire season. While Lawson is athletic, he has one of the best back-to-the-basket games in the conference and understands how to operate in space in the paint. That makes him difficult to defend. 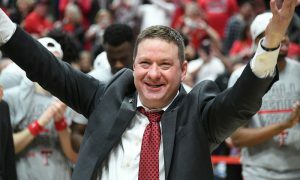 He’s developed enough of a 3-point shot to keep defenses honest, which opens up opportunities for players like Dotson and Grimes. But, in crunch time, the ball is going to Lawson and everyone knows it. 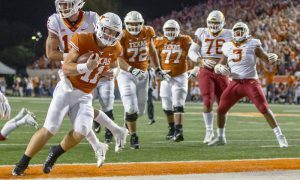 Texas: No team has been more back-and-forth in this Big 12 season than the Longhorns, who have won no more than two games in a row and had three two-game losing streaks and another three-game losing streak. Texas ended up going 4-6 in its final 10 games and, as mentioned, 1-5 without Roach. But Texas has managed to notch some impressive wins, including beating Baylor, Iowa State, Kansas and Kansas State. So the Longhorns are capable of tangling with any team in the league. 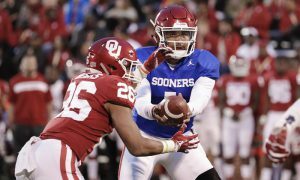 Kansas: Unless you’re been living under a rock, you’re probably aware that the Jayhawks’ 14-year ride atop the Big 12 regular-season standings ended with their loss to Oklahoma last week. But the Jayhawks are still quite capable of winning this Big 12 Tournament, and it’s right in their backyard in Kansas City. Since Feb. 2 Kansas is 7-3 and finished undefeated at home. The problem is that Kansas has been terrible on the road this season (3-8). But, guess what? Technically, this isn’t a road game. At neutral sites Kansas is 3-0. Texas: Hayes has the best field-goal percentage of any Big 12 player in conference play at 72.8 percent. 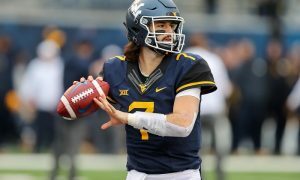 Kansas: Kansas is No. 2 in the Big 12 in field-goal defense (41.5 percent) during league action, behind only Texas Tech. Who wins? : Most will take Kansas in this game. I’m taking Texas. While the complexion of Kansas’ team has changed markedly since their two meetings in January, Texas has not really changed since then, especially when it comes to personnel. 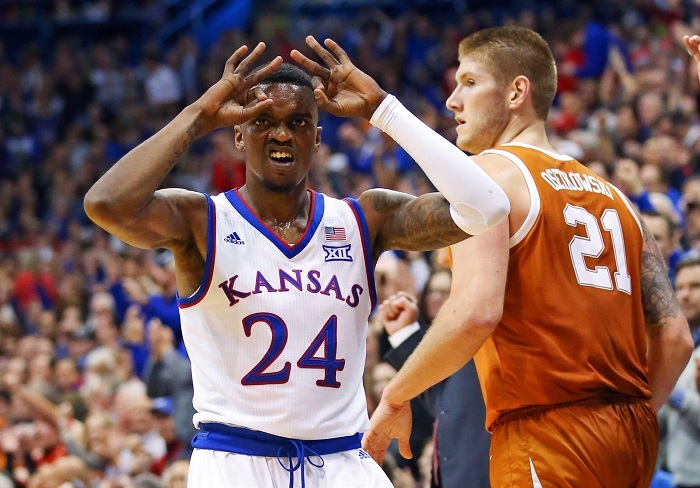 Texas won the game in Austin by 10 points, but more importantly they lost to Kansas in Lawrence by just two points. Now that Roach is back the Longhorns have their full backcourt to play with, and Roach will likely be hungry to prove something. Hayes has turned into a solid defender, but he’ll probably do more time working on McCormack and leave Lawson to the more experienced Osetkowski. That leaves room for Hayes to freelance a bit as a shot blocker. Texas needs to force Kansas into shooting a lot of 3’s, something they aren’t good at right now, and keep them from driving and kicking. This one will be close, a fitting end to a long day of basketball. But I think Texas pulls it out because, well, if Texas wants to reach the NCAA Tournament, it must win this game.